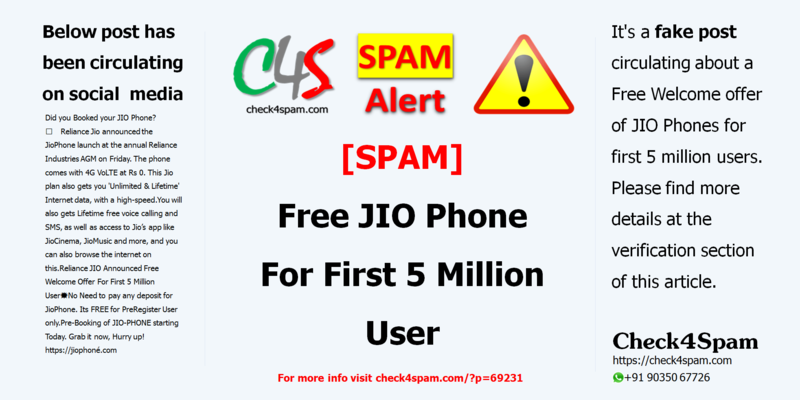 It’s a fake post circulating about a Free Welcome offer of JIO Phones for first 5 million users. Please find more details at the verification section of this article. Reliance Jio announced the JioPhone launch at the annual Reliance Industries AGM on Friday. The phone comes with 4G VoLTE at Rs 0. This Jio plan also gets you ‘Unlimited & Lifetime’ Internet data, with a high-speed. You will also gets Lifetime free voice calling and SMS, as well as access to Jio’s app like JioCinema, JioMusic and more, and you can also browse the internet on this. No Need to pay any deposit for JioPhone. Its FREE for PreRegister User only. Pre-Booking of JIO-PHONE starting Today. Grab it now, Hurry up! Check out all similar fake promotional posts circulating on social media.